While I was in graduate school, we rented an apartment in West LA. I had noticed there was a cat in the courtyard when we looked at the apartment, but we didn't see it much. One hot August afternoon, we heard a cat in the courtyard yowling and yowling. I went down to see it - a scrawny gray cat standing in the middle of the courtyard. I couldn't figure out what was wrong, so I went back upstairs to the apartment in order to consult Mike. He decided that maybe it needed water - and he was right! The cat drank and drank and drank. So, I brought her some tuna fish, too. Needless to say, I had made a friend. We weren't supposed to have animals in the apartment, but this one moved in slowly. She started out sleeping on the floor near the door, then she moved to the couch. Finally, she took to sleeping on a chair filled with blankets. 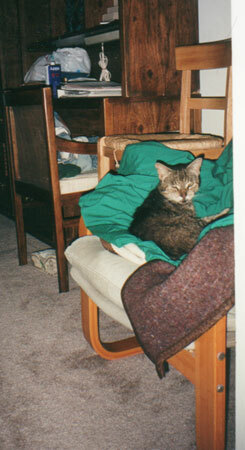 As it turned out, Gracie was about 14 years old. 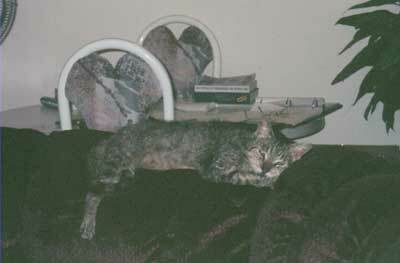 Our landlady, Mina, wasn't much of an animal person, but she allowed Gracie to stay in the complex after she was abandoned by a tenant - 13 years before we met her. Gracie pretty much took care of herself, Mina said. She put out food for her every night and the cat usually drank from the puddles left by the sprinklers. Mina was out of town the week we met Gracie; thus, all the yowling. 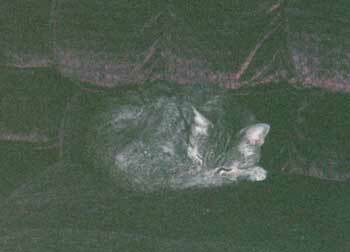 She said that she usually didn't worry about provisions, because, as was ours and the experience of previous cat sitters, Gracie generally ran away for the period that Mina was gone. We were happy to know Gracie - such a sweet, loving little old lady. Mike was her favorite - for whole head scritchings and for curling up behind on the couch. I'm not sure if it was comfortable, but she liked if he would lean against the end of the couch at an angle, so there was a little warm nook between Mike and the corner of the couch for her to curl up in. A little funny story: Since Gracie had reportedly lived outside her whole life, we didn't think she was litter trained. We weren't supposed to have pets in the apartment, so Mike and I were worried about trying to train her. Part of the time we had her was during the spring rains... chilly torrential downpours that would last for days. 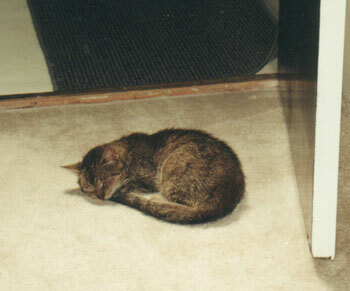 Poor old Gracie would drag herself up to our apartment on the 2nd floor to find somewhere warm to sleep. Before we went to bed, I would put her back outside, in case she needed the restroom during the night. After a while, I told Mike that I felt so cruel and we just had to try a litter box. We discussed it, and finally brought home a pan with some litter. I set it up while Gracie was sleeping, figuring I would try to explain it to her when she woke up. While I was in the kitchen doing stuff, she got up, found the litter box, and used it without incident. I exclaimed from the kitchen my surprise that she knew what it was, and she just gave me this look that said "Yeah, it's about time lady! Those stairs aren't easy at my age!" Mike saw that look, interpreted it as I had, and we've laughed about it since.